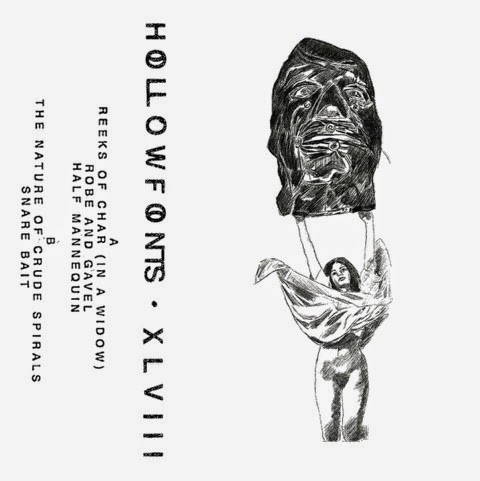 Michael J. O’Neil, with his first release under the moniker of Hollowfonts, explores the depths of drones, noise and ambience. Putting out his first album on a Denmark-based label (not Posh Isolation… I know) called, Phinery. A new label that has been delivering us sounds that have been becoming a lot more popularized, yet still inaccessible to some. The approach of the album is the constructing and building up of sound collages, creating a feeling of delusion throughout a whole track. Extensively cavernous to undergo. The first half of the track, Crude Spirals begins with an electronic beat that nearly made me believe Andy Stott produced the track. Within the tune, the layers and textures expand more and more until it transforms completely into an atmospheric landscape of oblivion. A resonance settling you slowly in a void, losing every bit of self conscience. Unfortunately the tape is now sold out, but I was lucky enough to receive one, though you can stream it below!